John Lauckner, GM vice president for global product management, speaks to fellow panelists at the Automotive News World Congress. DETROIT -- Consumers car-shopping in the 2020 model year will find vehicles that are smaller, lighter, and use a wide range of powertrains and materials. They may run on synthetic fuels. 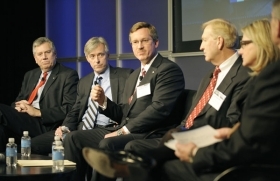 Five industry executives offered their predictions for the 2020 model year at a panel on North American product development Wednesday at the Automotive News World Congress. They agreed that plug-in hybrids and battery-powered vehicles will be commonplace. But they also said that their companies differing strategies for future products will serve each of them well in the future. The cars for the 2020 model year will be increasingly electrified in a big way, he said. That technology is required to meet the new higher CAFÉ regulations. We are not going to meet these standards by magically cloning an internal combustion engine that does double what it does today. We made a huge investment in the Chevrolet Volt because we believe that is a huge technology that is going to be in the mainstream, he said. Barb Samardzich, Ford Motor Co. vice president for global powertrain engineering, said she expects vehicles that are lighter, smaller and considerably more fuel efficient for the 2020 model year. But the powertrains will reflect the countrys energy policy. When you establish a policy that wants to drive toward electrification, she said, tax incentives for battery manufacturers and buyers need to be considered so the vehicles are affordable. Frank Klegon, Chrysler LLC executive vice president for product development, predicted more variety for the consumer in the 2020 model year. I still think the product variety will still be in the market place. When you look at product cycles, behavior and demand are not going to change, he said. The focus will be on reducing the energy the vehicle consumes, he said, whether that is accomplished by weight reduction or some other things. He said, though, that the average vehicle might be smaller than today. John Krafcik, acting CEO of Hyundai Motors America, agreed that the market might move to a smaller segment. But the cars of that size may not be notably lighter than todays, because theyll be loaded with more features. I think the weight reduction in the fleet will come as we downsize to meet corporate average fuel economy standards, Krafcik said. Small engines, hybrids, diesels, and more fuel efficient gasoline engines will be in the marketplace, as well as some electric vehicles, said J.E. Ted Robertson, chief technical officer and executive vice president of new product creation at supplier Magna International Inc.
I think we will start to see a lot of new materials. We are working inside Magna on a lot of weight-savings materials. The area of explosion besides materials will be electronics -- wireless electronics, he said. PRESENTATION: J.E. Robertson, Chief Technical Officer & EVP of New Product Creation Magna International Inc.